"We have found no clear authority controlling the situation faced by the board," said Broward County Attorney Andrew Meyers. On Election Day, Broward County collected more than 600 provisional ballots. The vast majority were declared invalid by the county's canvassing board judges for reasons ranging from registering to vote too late to previously voting to voting at the wrong precinct. But a couple hundred provisional ballots were held in limbo. Those ballots were the result of a connectivity issue in the system that precincts use to look up voter registrations, said Pat Nesbit, the elections day operations manager for Broward County. Voters would swipe their ID and the precinct system would show they weren't registered voters. But when staffers called the Broward elections headquarters, the voter's registration would appear. Precinct workers had those 205 voters fill out provisional ballots. On Election Day, Broward election staffers set those 205 votes aside, removed the anonymous ballots from their signed envelopes and counted them up in a voting machine that didn't add those numbers to the final vote count. The elections department didn't originally intend to have the canvassing board review those votes, but after uproar from lawyers for the Republican Party, the office handed them over to the board, which usually reviews ballots still in the envelopes. 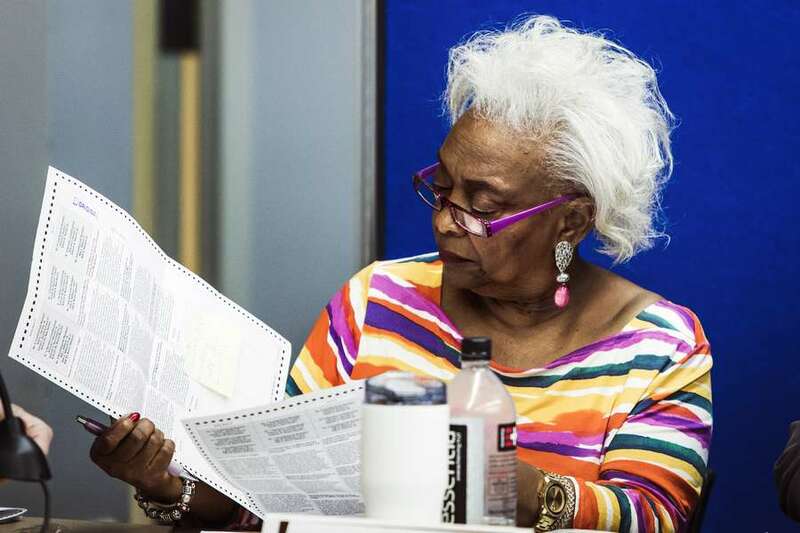 "The ballots cannot be identified," Snipes confirmed when a lawyer for the Republican Party asked. Republican Party lawyers immediately pressed Snipes about the future of those 205 votes and if they'd be counted. Snipes declined to answer and continued judging signatures on remaining ballots. There is no statute guiding what happens next. "This process doesn't exist. The process is that the ballots aren't opened. I would suggest to the board that this process would stop," said Leonard Collins, a lawyer for the Florida Republican Party. Broward must present its unofficial vote total from the midterm elections to the state by noon Saturday. Recounts are expected in races for U.S. Senate, governor and commissioner of agriculture, and Snipes has become a target for Republican politicians alleging corruption and incompetence after her office was still counting thousands of early and absentee ballots in the days following Tuesday's election. The board concluded its Friday session about 10:30 p.m., but the supervisor of elections has not yet announced a decision on how to handle the ballots. (UPDATE — 3:35 p.m.: Twenty-two improperly cast ballots, considered void due to mismatched signatures and other violations, were included Saturday in the final vote totals submitted by Broward County to the Florida Secretary of State's office. The illegal votes were part of a batch of 205 provisional ballots that were reviewed by the Broward canvassing board Friday evening. Snipes recommended the canvassing board include the entire batch in its returns, despite vehement opposition from attorneys for Florida Gov. Rick Scott's campaign for the U.S. Senate. Snipes said Saturday that it "seems unfair to me to disenfranchise 205 voters at the expense of a small number." "And if that's being unfair to anyone, I don't think it's a large enough number to affect the difference between who comes out of the recount as a victor," she added. After the county met its noon deadline to submit unofficial vote totals to the office of Secretary of State Ken Detzner, the general counsel for Snipes, Eugene Pettis, said the entire batch was "included in the process" and counted. William Scherer, an attorney for Scott's Senate campaign, said, without offering evidence, that some of the illegal ballots included instances of double voting.